Translation, while often misconstrued as neutral, is an inherently political act. It can amplify a voice, especially when it’s rendered into English, which is almost always the dominant language with the wider reach. While I like to point this out as a literary translator myself, the reality settles in when I speak with a novelist who, for the past year and a half, has been working as a legal interpreter. Valeria Luiselli had never translated before working at an immigration court with Central American children seeking sanctuary in the U.S. There, she would discover that presenting the stories of these children accurately and convincingly to the court in English is their only chance of escape from violence or insecurity at home. But, unlike the literary translator, she found she had limited control over the narratives she was given. Between the children’s words always lurked a heavy silence, a much longer story that wasn’t being told. 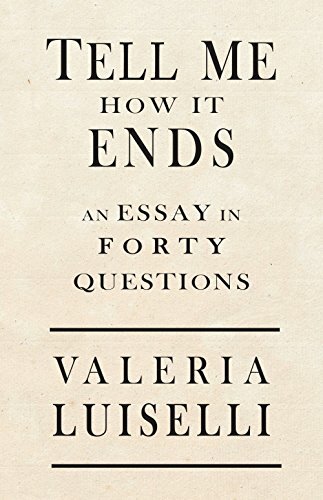 Luiselli’s book, Tell Me How It Ends: An Essay in Forty Questions, out now from Coffee House Press, is an attempt to record, in English, what didn’t get translated. For while she also writes books in Spanish, she had no trouble deciding which language to write the one distilling her experiences in court. The versions of these children’s stories that do already exist in English, in the media primarily, are incomplete and oversimplified, and the ones packaged for the courts are not much better. It was in 2014 when she first learned that tens of thousands of children were turning themselves in to U.S. Border Patrol after arduous, perilous journeys from Honduras, El Salvador, Guatemala, and other places. This would widely become known as an immigration crisis that to this day continues, where unaccompanied children have been fleeing escalating violence across Central America. The numbers are staggering and the circumstances harrowing. To make these journeys, children travel on the backs of trains and cross deserts with limited water supply, where they also run the risk of being kidnapped and murdered. If you are a girl crossing the border from Mexico, there is an 80 percent chance that you will be raped; many take birth control as a precaution. Too many of these children, some as young as two years old, are sent back. Mexican children don’t stand a chance, as they can be deported immediately under U.S. policy if Border Patrol determines they meet certain conditions. At the time she realized this, Luiselli, who is Mexican, was in the process of applying for her green card after having lived in the U.S. for six years. Her own burdens in navigating the exceedingly confusing and expensive immigration system (which I, too, am familiar with) seemed trivial in comparison to these children’s. She reached out to her lawyer at the time and asked how she could volunteer in court. It was then that she ended up interpreting at an immigration court in New York City, and found she was badly needed: the federal government faced an overwhelming number of children—80,000 between October 2013 and June 2014—and shortened the time they had to find legal representation: 12 months to 21 days. Luiselli’s job was to interview and translate the children’s answers at an initial screening, which were then reviewed by volunteer organizations to determine whether there were viable claims against deportation. If not, no lawyer was assigned and the child was eventually deported. Tell Me How It Ends: An Essay in Forty Questions is at once a deft exposition on the injustices of immigration law, the long, bullying history of U.S.-Central American relations, and the obstacles and politics of translation. The book is structured around the questions she had to ask each child she interviewed. The first, “Why did you come to the U.S.?”, is already too complex—one not even Luiselli can fully answer for herself. The answers—persecution and abuse at home or the hope to reunite with a family member in the U.S.—come in pieces, not neat, linear narratives. Reticent children are often too embarrassed by their circumstances or worried about betraying their family to give complete answers. And no matter how many times Luiselli asks questions, “[t]he children’s stories are always shuffled, stuttered, always shattered beyond repair of a narrative order. The problem with trying to tell their story is that it has no beginning, no middle, no end.” Their stories, she suggests, are partly broken because their lives are. But the children don’t always know how to report their hardships. Luiselli notes that she must engage in a double translation: in addition to Spanish, she translates the language of children. In an interview with two young sisters, they evade questions, contradict themselves, and pretend to understand when they don’t. “When did you come to the United States?” she asks. “I don’t know,” they say. And where did you cross the border? “In court my dilemma is how to not cheat. That is,” she said impishly when we met, “in favor of the kid.” She had to exercise restraint when those two young sisters, for instance, gave insufficient answers, saying, as a child is told to, that they never got into trouble at home, were never punished, and only played. “What I needed to hear, though I didn’t want to hear it, was that they had been doing hard labor…that they were being exploited, abused,” Luiselli writes, visibly irked and ashamed that these are the realities that would grant the children asylum or special immigrant juvenile (SIJ) status. As a legal interpreter, she feels “powerless,” “hands and feet tied.” She cannot control the words that flow from the children’s mouths, and she has to listen even when it’s too painful. Her job is exhausting and emotionally demanding. Particularly, she struggles to provide an answer to her curious daughter whose demand, “Tell me how it ends, mamma,” becomes a common refrain throughout the book, because most of the children slip from her reach after the screening. Through the media we’ve learned of these stories but also failed to understand them. Luiselli, in seeking “to rethink the very language surrounding the problem,” tries to translate the masked language of news sources, including The New York Times, pointing out their propensity to refer to children as “illegal immigrants” rather than “refugees;” of problems to be rid of rather than confronted. She concludes that “the only thing to do is tell [these stories] over and over again…in many different words,” but she wrote this before Donald Trump was elected president. Circulating these stories, particularly in English-language media, could have adverse consequences. With the so-called “Dreamers,” or undocumented immigrant youth in the U.S., flagged by the current administration, Luiselli wonders what more attention would mean for these Central American kids who have gone relatively unnoticed. “Will this government target them more if they become more visible?” she asked me. The last impression Luiselli leaves us with is unexpected: three photographs where Manu poses for the camera, hanging by his arms from telephone wires, “practicing the art of flight.” In the image, his body is completely dark and silhouetted, preserving his anonymity, as lawyers had advised—Manu is not his real name, even though he wanted Luiselli to use it. He personally wouldn’t mind being seen; he might prefer it. But the pictures we’re offered of these children, just like their translated words, struggle to gain focus. Elisa Wouk Almino is a New York-based writer and translator from Portuguese. Her writing and translations have appeared in, among other places, Guernica, Stonecutter Journal, n+1, Hyperallergic, The Nation's "Noted," Ugly Duckling Presse’s 6x6 Journal, Asymptote Journal, and Words Without Borders, where she was formerly the book reviews editor. She is currently the associate editor at Hyperallergic. Erpenbeck's mastery of language and image ripples through her pages. Her prose is so controlled and flowing. Her chapters are compact lessons in form and function, some long, most short, all well-contained. Were I to claim that Jean-Philippe Toussaint shared a certain amount of common ground with Ian McEwan, I might be in danger of coming off as flippant or, worse, willfully obtuse. Toussaint, after all, is a Belgian avant-garde novelist known for his radically plotless books that seem intent on revealing as little as possible about their protagonists. McEwan is a purveyor of skillfully propulsive novels about upper-middle class English people, who has — fairly or unfairly — become synonymous with upper-middlebrow literary fiction. Toussaint is an exemplar to those of us who want to see the novel being taken to places it has not yet been. Ian McEwan is a writer whose books David Cameron has used for PR purposes (he once arranged to have himself photographed on a suspiciously empty tube between Epping and Charing Cross, cross-legged and suavely engrossed in On Chesil Beach). It’s the kind of comparison that could easily be mistaken for an attention-grabbing stunt. But I’m going to make it anyway — in good faith, I assure you — because it’s one that kept occurring to me as I read Toussaint’s brilliant and compelling The Truth About Marie, the latest of his novels to be translated into English. I don’t mean to imply that Toussaint is really an upper-middlebrow novelist masquerading as an avant-gardist (he’s definitely not), or that he shares a sensibility or a set of artistic objectives with McEwan. They present the reader with very different kinds of experience, and demand very different intensities of reading. But they are each in possession of a rare and remarkable gift for creating stunning standalone scenes that involve the steep deceleration of narrative time. McEwan’s long and absorbing set-pieces — Enduring Love’s hot air balloon disaster, the battle scene in Atonement, the disappearance of the child in the opening pages of The Child in Time — are, famously, the best thing about his books. The truth about The Truth About Marie is that it is essentially one set-piece after another. It’s divided into three distinct parts. The first details the events of a single night, during which Jean Christophe de G., the wealthy lover of Marie (the ex-girlfriend of the unnamed narrator) suffers a massive heart attack in her apartment and dies on the spot. In her state of panic, she phones the narrator, who leaves his flat just half a mile away (where he has been making love to another woman, also named Marie) and walks through a Parisian downpour to be with her in the apartment they used to share. The second part jolts us back to the beginning of Marie and Jean-Christophe’s affair. It’s this section that really showcases Toussaint’s spooky powers of chronological manipulation, his idly urgent exploration of the vast spaces of a single moment. In a sequence that accounts for almost half the length of this short novel, the narrator (who offers us no plausible assurance of the reliability of his testimony) comprehensively details an occurrence at which he himself was not present: the transportation via cargo plane of a racehorse, owned by Jean-Christophe, from Tokyo to Paris. In the third part, Marie invites the narrator to come and stay with her in Elba at the home of her recently deceased father, and a forest fire breaks out that threatens to consume them. The novel, in other words, is three show-stopping climaxes specifically not in search of a plot. It’s as though the best, most audacious bits of McEwan’s books had been extracted from the stories of which they serve as centerpieces, in order to be fastened loosely together into some wholly strange and original (nouveau) nouveau romanesque construction. Falling back onto the floor, the body lay motionless, and Marie understood then that Jean-Christophe de G.’s heart had stopped beating. Marie approached the paramedics and looked down at the stripped body, its face hidden by the oxygen mask, its white inanimate flesh dotted with electrodes, skin like a fish, cod or flounder, and Marie couldn’t help thinking that it was this same motionless body that she’d held in this room less than an hour earlier in that very spot, this body stripped naked and dispossessed, objectified by a whole array of medical apparatuses, shaved, hooked to an IV and ventilator — this body reduced to its bare substance, bearing no sign of Jean-Christophe de G.’s personality. She realized then that up until this moment she hadn’t really looked at his body, not once throughout the whole night, not even while making love had she taken an interest in his body, she’d hardly even touched it, hadn’t paid it the least attention, being concerned as she always was with her own body alone, caring only for her own pleasure. Jean-Christophe de G. is depersonalized in death, “reduced” to an anonymous aggregation of parts. Most novelists would use this as a starting point for an attempt at reintegration, for a narrative that might endeavor to give this man back the identity taken from him by death. But Toussaint’s narrator makes no such effort, and Jean-Christophe remains a more or less wholly concealed figure (as does the narrator himself, and as does Marie). In fact, he casually informs us at the very beginning of Part II that Jean-Christophe de G.’s real name was actually “Jean-Baptise de Ganay” — a fact gleaned from his obituary in Le Monde — and then reverts anyway, for the remainder of the novel, to calling him Jean-Christophe. There’s something savagely vindictive about this insistence on ignoring the facts of the man’s life. He is denying Jean-Baptiste his real name, using the privileges of narratorship to punish him for his affair with Marie. There’s a lesson in this that might be too awful for us to want to learn, which is that death takes from us not just our lives, but also our right to insist upon a particular version of those lives. What we think of as “our” truths, in other words, are just as provisional and corruptible as what we think of as “our” bodies. There’s a suspect and slightly creepy moment not much later when the narrator admits that he may have been wrong in many of his assumptions about Jean-Christophe — or “Jean-Christophe” — but insists that he is on much surer ground when it comes to Marie. “I knew Marie’s every move,” he assures us, “I knew how she would have reacted in every circumstance, I knew her instinctively, my knowledge of her was innate, natural, I possessed absolute intelligence regarding the details of her life: I knew the truth about Marie.” As is so often the case with such excessive insistences, this draws attention to precisely the kind of uncertainty it attempts to conceal. The narrator does not, cannot, know “the truth” about Marie. Either there is a truth, and he doesn’t know it — because he wasn’t there — or (more likely) there is nothing like a truth to “know” about a person in the first place, let alone a person who isn’t oneself. So the substance of the novel is, necessarily, an indulgence of the narrator’s imagination, as he creates a vivid version of what happened before and after Jean-Christophe’s death. The Japanese section, about the transportation of the racehorse, is by far the most impressive of these. (It takes place, incidentally, just after the events described in Toussaint’s earlier novel Making Love, in which Marie, who is a successful fashion designer, brings the narrator with her on a business trip to Tokyo so that they can take some time out to concentrate on breaking up properly). It focuses much more intently on the horse than on the two human characters. There’s a long, nightmarish sequence in which Marie and Jean-Christophe remain in the hold of the cargo plane with the petrified animal, trapped in a metal container inside a winged metal tube hurtling through a turbulent night sky. The fact that the horse’s name is Zahir is a clue to the position he occupies in the narrator’s mind (Borges’s story “The Zahir,” which is about an object that completely and exclusively occupies the waking and sleeping consciousness of anyone who beholds it, is referenced as the source of his name). This animal, whose raison d’etre is speed, is being kept completely immobile inside a machine that is moving at incomprehensible speed toward a destination that is, to him, likewise incomprehensible. The scene, which seems to illuminate and magnify our powerlessness to escape the trajectory of time and the destination of death, produces in the reader a kind of base animal unease. At one point, the narrator happens across Marie and Jean-Christophe at a racecourse in Tokyo, and he observes them without their noticing him. It is not long after he himself has broken up with Marie. “I looked at Marie,” he says, “and it was clear to me then that I was no longer there, that I wasn’t the one with her anymore, this man’s presence revealed nothing if not the reality of my absence. I had before my eyes the striking revelation of my own absence.” This, in fact, is one of the few moments up to that point at which the narrator is actually present for the scene he describes. It becomes a sort of premonitory glimpse at the reality of his own death, and it illuminates the paradoxical way in which his absence has all along been the most overbearing presence in the novel. This is the way Toussaint’s writing achieves its revelations: at first slowly and imperceptibly, and then suddenly and blindingly. It’s a beautiful moment in a strange and unsettling novel that upholds its author’s status as one of the most exciting figures in contemporary fiction. And the food! If nothing else (and there is plenty else), the novel revels in its cuisine. Sentences are peppered with exquisite dishes throughout and take detailed note of the textures and presentation and garnishes, allowing reader gorge. Dishes served include pig’s ear, hard salami, putty-colored lambs tongue, rabbit ragù with pappardelle, salted brittle, and sardines. Ms. Almino, this is a succinct and necessary essay about the work Luiselli and others are doing and the tragedy of America as a woefully lacking refuge. As a Canadian it breaks my heart, not that we are without our own racist and willfully ignorant population. If one can do nothing else, one can join PEN or Amnesty International as a paying or nonpaying member. Wow, really great review. So heartbreaking to think of these voiceless children coming into completely unknown territories. Being a recent green card holder myself I had, of course, already realized how privileged I was for being able to go through the immigration process legally, while so many risk their lives for permanency is the US. I hadn’t, however, thought about how powerful it was that I’ve always spoken English. Ms. Almino and Ms. Luiselli, have done a great job bringing to light the importance of translation and giving people the power of voice. Kadare’s fiction intuits the spirt of the art movements of his day, orbiting the dark ambiance of indie cinema, goth punk, shock installation.